I just got a call to remove honeybees hanging from the overhang/eave of a porch roof. I thought it was another call for a wasp nest but when I got the photos, it was indeed a colony building their combs on the exterior of this house - out in the open. No shelter whatsoever except from above. Already built about 5 or six combs. I have no idea what happened to the photos on my computer but I've asked the owner to re-send them and when I get them I'll post them here. This is upstate New York on the western side of the Catskill Mountains. I have never heard of honeybees establishing a colony and building exterior combs at this latitude. Can someone tell me what the heck is going on with these bees? A swarm got stuck. The didn't find a new hive location that they could agree upon and started building a hive in the meantime. It happens on occasion but I've personally never seen one. I briefly considered that but dismissed it rather quickly. But it does make sense. I've collected lots of swarms that left wax on the location they had settled on for awhile. Do you think the scouts are still looking or will this be the spot for them? I took one off the facia board of a slate roof 30 ft off the ground, have never seen that before either. Was 100 year old house in ritsy sectiion of town. Had nice combs brood and honey. Owner said they had been there before..probably be back next swarm season.. If they have comb undoubtedly the queen has started laying and they will not abandon the brood. They are there until the weather kills them off. As others have said they got stuck and could not come to a consensus on where to go from there so the biological imperative to get established took over and voila open comb. In more southern latitudes they might have a chance of making it through but doubtful in your location. I've done more than a few in my time and have a photo of one one my business card. This is me removing one from a home in Fayetteville, GA. I wish they were all this easy as there is no cutting or ripping into a structure, the bees are right there for vacumming and access is as easy as it comes. Georgia Wildlife Services, honeybee removal. Absolutely nothing wrong with the bees themselves it just a case of terminal inability to come to a conclusion, it happens to the best of us. Fortunately you can make the decision for them and move them into a box. The above colony made me two boxes of honey this year. Seen that, too. The one in the video was occupying the exact same site that a colony was removed from two years prior. The former colony was removed from under the bay roof and the area completely sealed to prevent reentry. Even so it was still attractive to the next swarm as you can see. I have seen a few open hives in MA. and N.H.
And there have been photos where the bees build open air hives in trees as well. Like others have said, I think they just don't find a suitable space and the urge to start building the new nest takes over right where they are. Haven't seen one out in the open yet. Would make it a lot easier to get. Best kind of cut out there is. John, Don't forget to get pictures! It's warm enough here for the bees to survive in the open. We get quite a few every year. 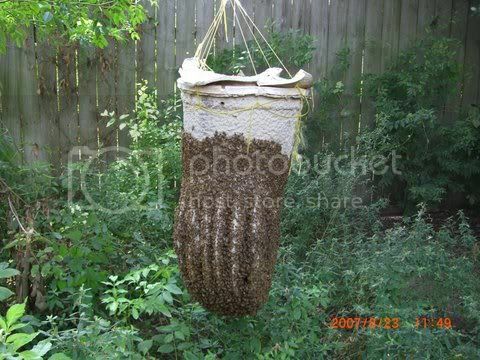 I have only seen one un-occupied open air hive here in CA, it obviously didnt survive being at the top of a pine tree about 30' off the ground. My most recent swarm catch last week found a small swarm starting to build comb on a cyclone fence gate. That small swarm is being fed now and building comb quickly in a nuc, along with a drawn frame I threw in there for them!! I hope they make it as they are the lightest colored bees I have ever seen, like sunkists!! Open air colonies are not the norm by any means but I remove a half dozen or so of them every season. I have one I am doing this coming week in fact. We have very mild winters and I have removed a few by all accounts that had been there three plus years! Amazing they can withstand the elements upon them this long a period. Removed this hive a couple of months ago above a sliding glass door. Second time I have seen this happen. First time was in an orchard. Annette, that one is absolutely beautiful. 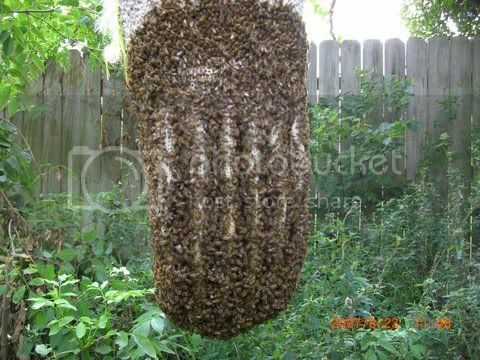 I love the open air combs and wish I could keep a good strong colony open air for the ultimate observation hive.